The last Sumatran rhino in the Western Hemisphere began a journey Friday from Ohio to its ancestral southeast Asian homeland on a mission to help preserve the critically endangered species. The 8-year-old male, Harapan, will make an air, land and sea trip of more than 10,000 miles. Including stops, the journey's expected to take some 50 hours before the rhino reaches an Indonesian sanctuary. 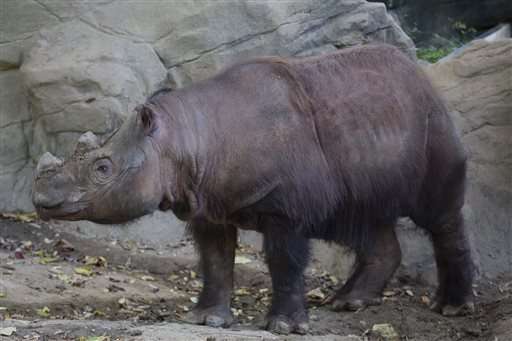 A veteran Cincinnati Zoo animal keeper who was at the Sumatran rhino sanctuary when Harapan's older brother became a father there in 2012 is accompanying the rhino, along with a zoo veterinarian. Conservationists hope Harapan can mate with one or more of the three females in the Sumatran Rhino Sanctuary in Way Kambas National Park. Zoo officials said the 1,800-pound rhino underwent medical checks and was trained to walk into and voluntarily remain in a specially made travel crate. Keeper Paul Reinhart and veterinarian Jenny Nollman will travel with Harapan, who will have six cases of ficus along with bananas, apples and pears for his in-flight meals. Numbers of the two-horned "hairy rhinos," descendants of Ice Age wooly rhinos, have fallen by some 90 percent since the mid-1980s as development of their forest habitat and poachers seeking their horns took their toll. Including three Sumatran rhinos in a sanctuary in Malaysia, only nine are in captivity globally. Harapan's brother Andalas lives in the sanctuary with three females and his one male offspring. 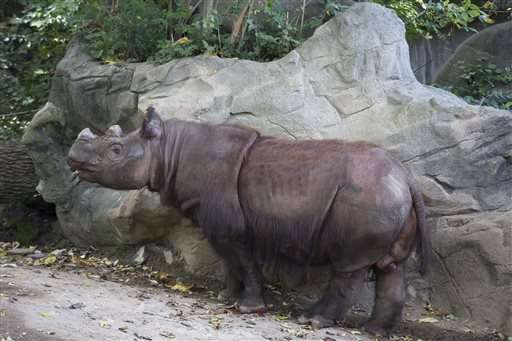 Harapan's departure ends the Cincinnati Zoo's captive breeding program for the species that produced three rhinos. 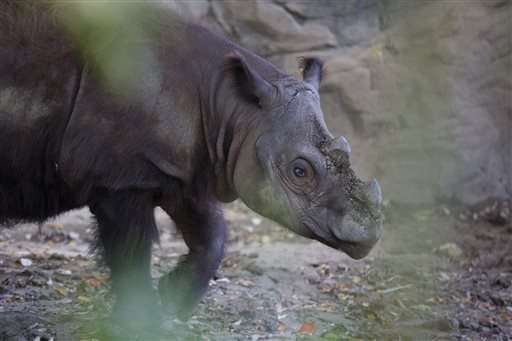 Jim Young, 55, of Cincinnati said he saw all three of the rhinos that were born at the zoo. He was there Thursday for the zoo's last public viewing of Harapan. "I think they're an amazing animal," Young said. "So we'll miss him, but I'm happy for him .... to be able to have him go to Sumatra and repopulate." Zoo visitor Kristine Strange, 61, of Kohler, Wisconsin, agreed, and said more needs to be done to stop poachers who go after rhinos for the horns that in some parts of Asia are prized for supposed medicinal qualities. "I think we should do everything to help all the endangered species," she said. "I feel strongly that we need to go after the main issue, which is people hurting the animals." Terri Roth, director of the zoo's Center for Conservation & Research of Endangered Wildlife, said last week that officials know that giving Harapan "the opportunity to breed in Sumatra is the right thing to do for the species." Harapan's and Andalas' sister, Suci, died from illness last year at the zoo. Indonesian officials are anxious to get Harapan to their sanctuary. They have said they don't want to be dependent on other countries in conservation efforts by sending rhinos to be bred abroad, but welcome technological or scientific assistance for their breeding program. Conservationists and government officials met in Singapore in 2013 for a Sumatran Rhino Crisis Summit to discuss ways to save the species.